H&H Classic Burley Kake in an Invicta bulldog. Rainy morning in the Derby City. Having Peacehaven/Wessex Classic in the Feddy Becker 4♧ dublin. Still on the Billy Budd in the Thompson house pipe from yesterday. Lots of intermittent chores and doings. 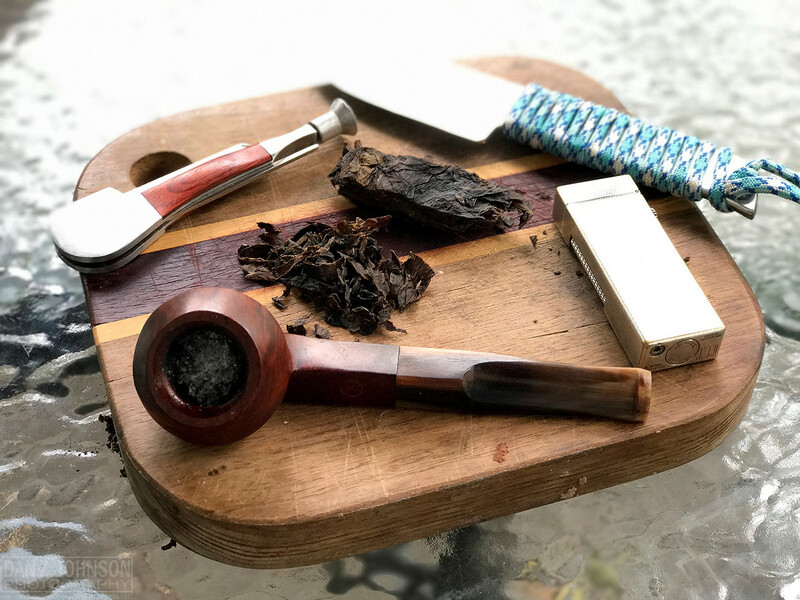 Packed for next, a bowl from my "best of the rest" bowl, with the last of Frog Morton Cellar along with three or four other blends, very dry but likely still mighty good, in a Ben Wade blond straight billiard clencher form my local independent pipe shop. My Mixture 965 while I watch paint dry. First smoke of the month is a bowl of McClelland 40th Anniversary rubbed out in a Country Gentleman. Very nice smoke indeed. Now having some Orlik DSK in a Tsuge Billiard. Testing out a new homemade virginias/unflavored black cavendish blend in a savinelli billiard. C&D Burley Flake #2 in a Fiamma Di Re straight squat bulldog. Gawith Hoggarth Dark Plug in a little French pipe with bone stem that I got from Max Capps. Now smoking MacBaren Modern Virginia Flake in a post WW2 Pre-Republic Peterson Dublin straight smooth X155 Bulldog with a sterling silver band and a black vulcanite p-lip stem. Ice water and bergs is my evening drink. Rattray's Hal O'the Wynd in a GBD Natural bent squat bulldog. Esoterica Brighton mixed with a little bit of Blending Perique in a System Standard 307 p-lip. Ice water to drink. Made pizza from scratch for m'lady and myself, and am half way through this bowl of Sam Gawith Medium Virginia Flake in a 2014 Savinelli Gaius smooth brown slight bend black acrylic stem and ferrule 320KS author. Suzy and Molly just stood there and watched us eat. I don't think they were happy we didn't share the pizza with them. Then again, I don't eat their tuna, either, so nyahhhh!!!! Watching the Red Sox-Yankees game. Salty Dogs plug in a Mastro de Paja Pipe Club of London 2017 POY paneled bent Dublin. Now smoking 2012 Anniversary Kake in a smooth medium bend 1979 Chippendale (Charatan second) Rhodesian 49 with a black vulcanite stem. Salty Dogs plug in a Blakemar Yachtsman. Part way through this bowl of Seattle Pipe Club Rainier Levant in a medium bend smooth paneled 2017 Turkish Meerschaum with a gold and black swirl acrylic stem. A third of the way through this bowl of D&R Raccoon’s Delight in a smooth 1976 Canadian GBD Seventy Six 256 with a black vulcanite stem. Working and phone chatting about pipe tobacco. I am smoking my second pipe of the day. This one is actually a DGT of a bowl of Tasty Kake in my '54 Shellbriar, a bowl I smoked just before retiring yesterday and only smoked about 1/2way. This stuff likes to go out. Frog Morton in a black blasted and bent large billiard for Saturday morning. Watch City Cigar's Old Dominion in a Rinaldo Lithos Silver Line YY rusticated straight squat bulldog. Germain Brown Flake in a Wiley Galleon with a side of Singell Darjeeling. 6 yr. old Mac Baren Scottish Blend in a Castello Sea Rock KKK bent billiard. After some tasty (vegetable) Burgers with Halloumi cheese and those dried onions (from Hot dogs f.e) I enjoyed a bowlful of 3Ps in my Cob and am now following it with a nice bowl of Bold Kentucky (in another cob) to round off the evening. Everytime I smoke BK I remember why I love it so much! Unreached when it comes to dark fired Kentucky blends imho. SWRA in an LHS Superfine Bulldog. This pipes 'rim beads' are outies rather than innies, providing an ergonomic grasping point and the finish is almost a simulated ring blast, but it's a carved surface. Salty Dogs plug in a Savinelli New Art bent pot. 6 yr. old Mac Baren Scottish Blend in a Ser Jacopo Picta van Gogh "05" sandblasted hawkbill. Watching the Cubs & Braves. 4 yr. old Capstan gold in a GBD New Standard straight standard bulldog. Now smoking Planta Mild English in a 2002 Ser Jacopo Delecta Fatta A Mano R1 sandblast Rhodesian with a smooth extension at the shank with a black acrylic stem. Now smoking Peter Stokkebye Bright Virginia in the first pipe Trever Talbot made when he went to France many years ago. It's a smooth straight Algerian briar Billiard bowl with a long Canadian stem, unbranded. Ice water and floaty widdle ice bergs is my evening drink. D&R Acadian Bright in the rain. Esoterica Penzance from 2010 - In a Savinelli Silver 606 EX - Bent Billiard - with a dram of Balvenie diluted with a finger of chilled water. Just finished smoking Peter Heinrichs Curly Block in a straight black sandblasted 1968 Dunhill Shell bulldog with a black vulcanite stem. Time for dinner! Happy Brown Bogie here, with a 50/50 Dark Burley/Bright Virginia mix as kindling. In some kind of a briar. Relaxing after a wonderful baby back ribs and baked beans dinner with a bowl of Planta Anno MMX (After Dinner Mixture) in a 2002 IMP smooth full bend egg shaped meer with a black acrylic stem. Figured, well, if it's an after dinner smoke, it was due to burn! Watching the Pirates-Reds game.